Did you hear? Over in Japan, Punyus dropped a plus size Sailor Moon Collection! No worries, if you want to get your curves into this range, we share how too! GIRL! Sailor Moon just got curvier! Popular Japanese comedienne Naomi Watanabe is no stranger to standing out from the crowd. She rose to fame in 2008 as “the Japanese Beyoncé,” and later went on to perform shows oversees, making her a body-positive spokeswoman for plus-size women everywhere! She then went on to establish her own plus-size label, PUNYUS. Well, that very label has partnered up with anime’s most well-known franchise: Sailor Moon! That’s right, a Punyus Sailor Moon collaboration launched at the end of April in Japan featuring a wide range of clothes from t-shirts to sailor suit schoolgirl costumes. Always a star of the show and filled with the Beyoncé aura, Watanabe modeled the cool pieces herself! It’s totally romper season and Watanabe is rockin’ a spring picnic look! This gingham-checked romper retails for 8,629 yen (US$76.13) and along with the above-pink, the rompers come in red, blue, dark green and yellow, representing Moon, Mars, Mercury, Jupiter and Venus respectively. Each character appears on the left breast of their corresponding outfit, so you can represent your fave with style! Any Luna fans out there? You can cop the Luna One-point Border High-necked T-shirt, available in six colors for 4,309 yen (about $38.04 US). 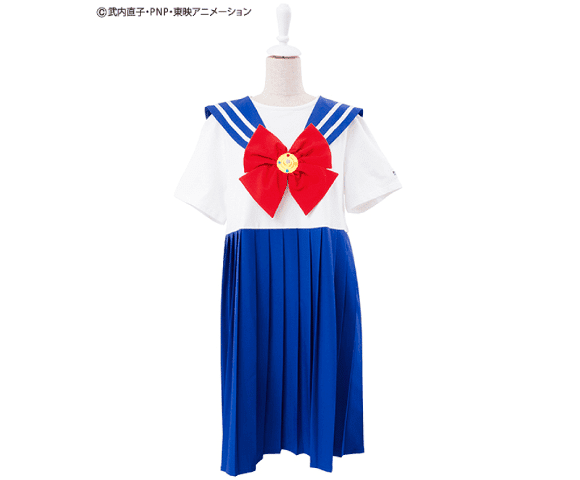 This baby, the Sailor Moon Uniform Dress retails for 9,709 yen (about $85.75 US) and also comes in pink if you want to switch up the flair! Watanabe, Punyus and Sailor Moon in Japan is a trifecta of popularity, so this collection will definitely disappear fast! If you’d like to see the rest of the collection and make an order for delivery within Japan, head on over to the official online store for more details. For those curvy fashionistas outside of Japan, there’s the option of an international forwarding services such as Tenso so you can get your shōjo manga on, too! Are you a fan of Sailor Moon? Which piece is your fave? Did You Know that We Have a Plus Size Boutique Directory? Oh Yes!